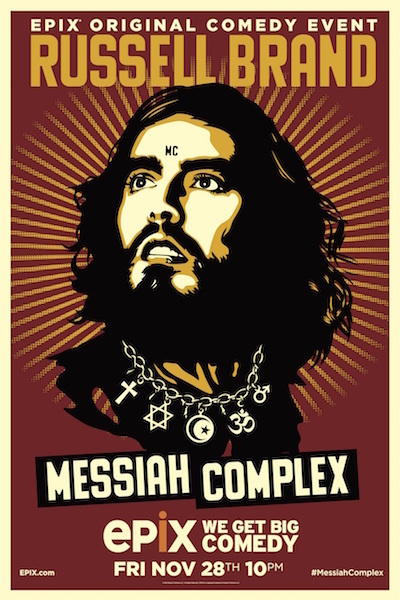 Filmed live at London’s Hammersmith Apollo, Russell Brand: Messiah Complex takes a hilarious and scathing look at our insatiable craving for icons and divine wisdom. Through the lens of contemporary politics and culture, Russell focuses on heroes Malcolm X, Che Guevara, Gandhi, and Jesus Christ to lay waste to conventional thinking in an outrageous 90-minute special that holds nothing sacred. In addition to his standup performances, Russell has successfully brought his caustic wit and penetrating observations to the printed page. His works include Revolution , in which he hilariously lacerates the straw men and paper tigers of our conformist times and presents; and a wildly funny and astute adaptation of The Pied Piper of Hamelin, the first in a series of Trickster Tales through which he brings his unique contemporary sensibilities to the classics.